I know I’m in the minority here but stuffed cabbage is my all time favorite comfort food. I could eat it all day every day for a month and not get sick of it. I kid you not. Like the Porlos Testa and the Green Bean Salad this is my grandmother’s recipe which she probably learned from her Hungarian mother. My mom picked it up from her and that’s who I learned it from. Four generations at least! 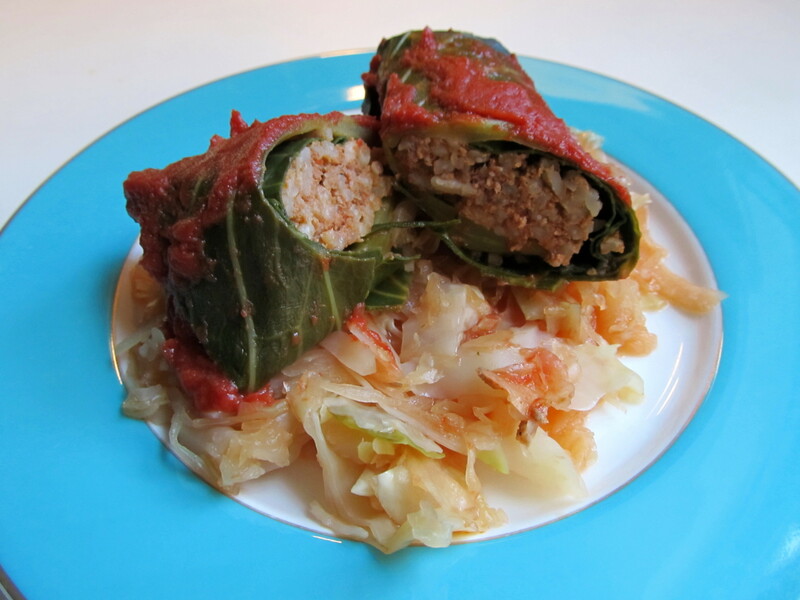 I love love love this stuffed cabbage! Of all the things I’ve written about so far this is the one which really carries me home to Grandma’s and my Mom’s kitchens. I really can’t decide if the stuffed cabbage is my favorite part or the bits of cabbage which get stewed in the bottom of the pot. Together they’re great. Normally I make this in the fall and winter, but last Friday I received a call from my mom saying she was making a pot of stuffed cabbage, was thinking of me, and as she knows it’s my favorite (you did read the above paragraph, right?) thought she’d call to say hi. Then, on Sunday Cheryl cooked dinner and made a Thai dish (it was really good) which had cabbage as an ingredient. Hmmm. Seemed like someone was trying to tell me something. While grocery shopping this week I decided to pick up the ingredients needed for making some stuffed cabbage. Surprisingly there aren’t many. When I first made this for Cheryl she was obviously very skeptical about it. 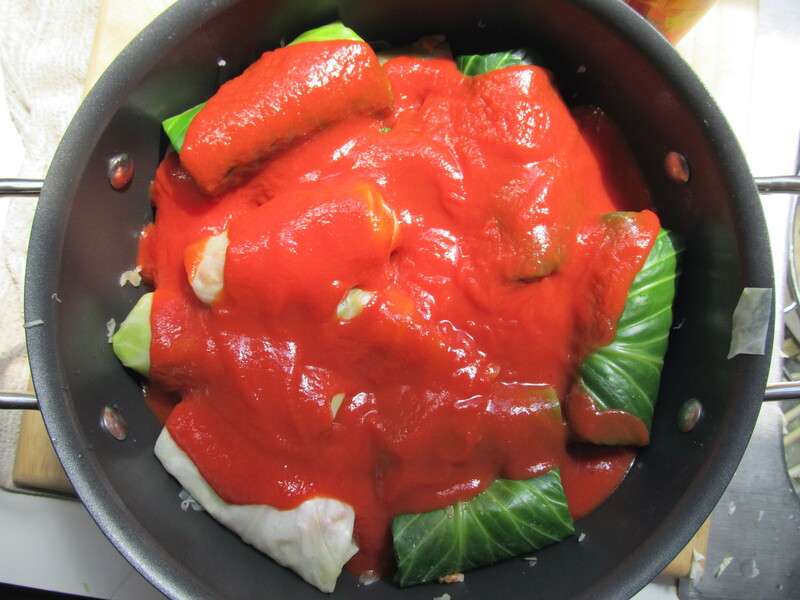 She digs it now and the pot of stuffed cabbage does not stay in the fridge as a leftover very long. I really don’t think my words can convey to you how much this dish means to me and how happy I am to have learned how to make it and carry the memories forward. This is why I enjoy cooking so much. I’ve got so many good memories related to family dinners and my grandmother’s stuffed cabbage is the ultimate family food memory for me. 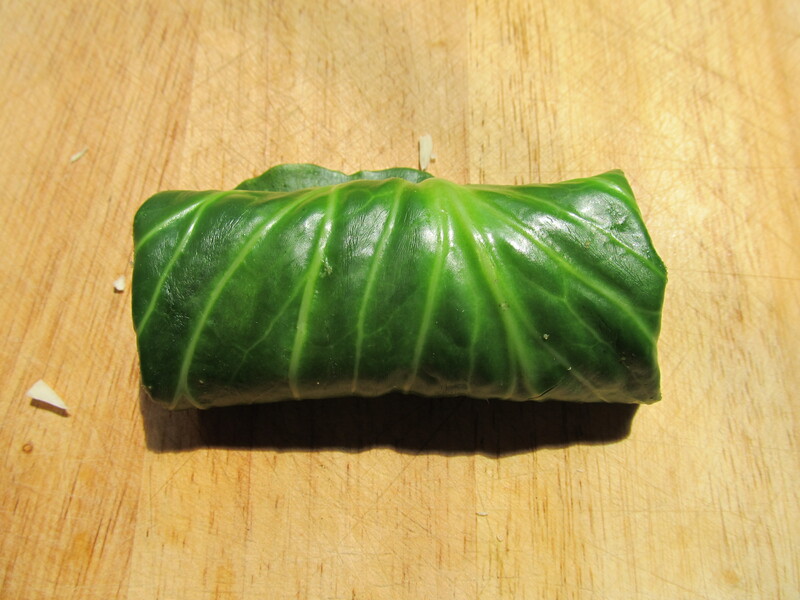 The part of making stuffed cabbage which I think scares everyone is the actual stuffing of the cabbage but it’s not a very difficult process. If you’ve made your own fajitas at any Mexican joint you can do this. When you break down all the steps it’s very easy, it just takes time to get through all the steps. I’ll usually pre-cook the rice earlier in the day so it’s all cool when I’m ready to start the main process. Cook it while you’re eating breakfast, set it aside, and it’s ready for you later. One thing about the recipe below. It’s not totally like Grandma’s. For some reason my grandmother did not use a lot of spices or herbs. Bless her soul, but salt and pepper were about as spicy as she dared go. So the spices in the recipe below are my additions. I think they work pretty well and are true to the spirit of the dish. This recipe will make between 20-24 pieces. 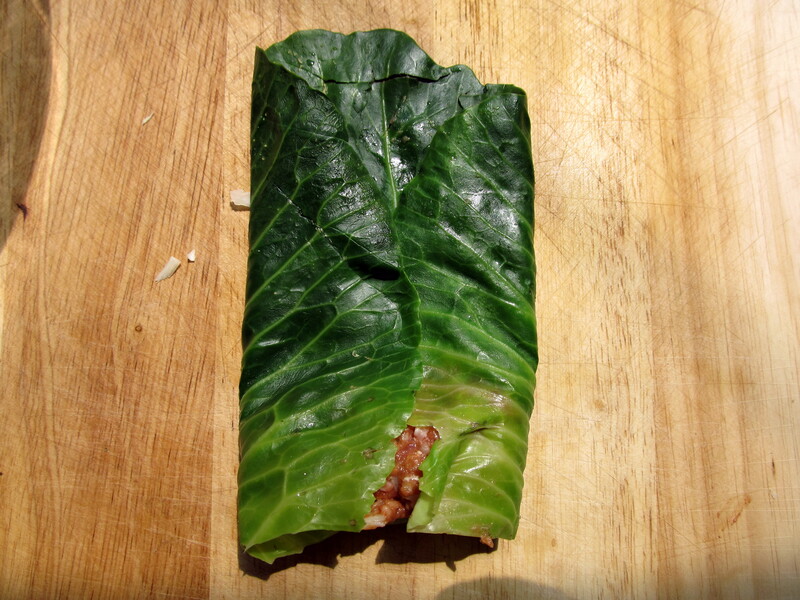 You want to use the largest leaves from the cabbage for the wraps but eventually you’re going to run out of them and will be forced to make some smaller ones. Do I need to tell you beer goes perfectly with this dish? Cook your rice and set aside. Rinse and drain the sauerkraut. Set aside. Bring a large pot of salted water to boil over high heat. The pot should be big enough to hold one head of cabbage. 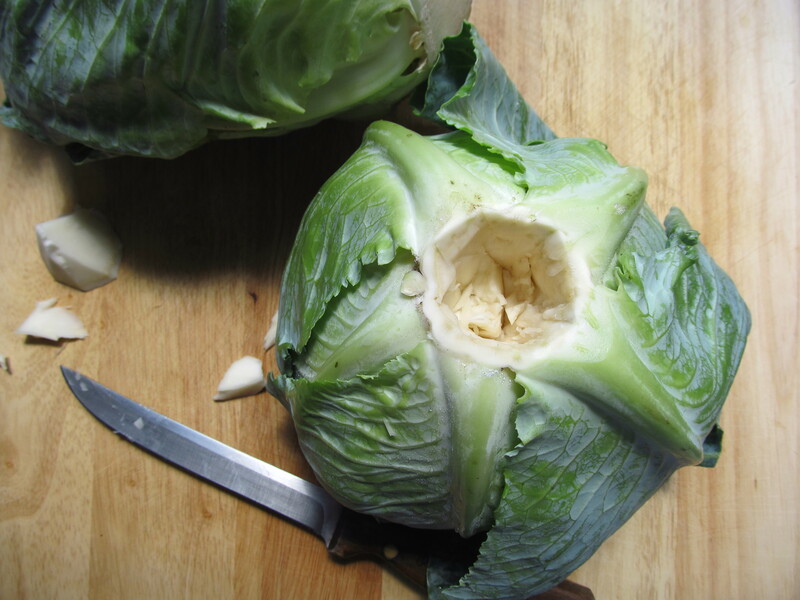 Remove outer leaves of cabbages and with a knife, carefully cut out the core from the bottom. Place the head of cabbage into the boiling water. As the leaves wilt and separate from the head pull them off, remove from the pot and drain. Keep pulling leaves off until they get small, should be about halfway to the core. Remove the remaining core and set aside. Repeat with the second head of cabbage. Allow leaves to drain and cool. 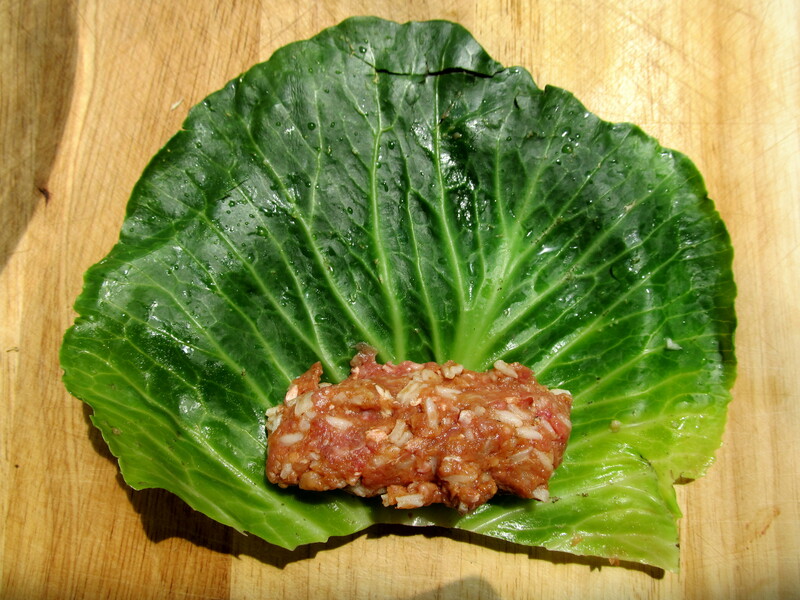 While the cabbage leaves are cooling, combine in a big bowl the cooked rice, meatloaf mix, 1 can of tomato sauce, and all the dry ingredients. Place your meat mixture at one end. It’s easy to roll with the bigger leaves. And the finished product. “Seam” side down. When finished rolling push the ends in a little with your fingers. Set aside and repeat until you run out of stuffing. 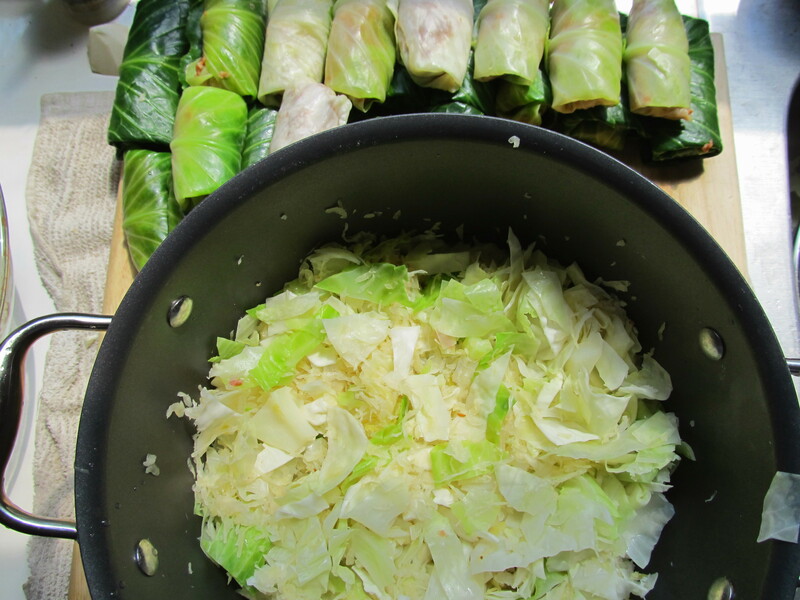 Next, chop up the remaining cooked cabbage leaves, mix in with the drained sauerkraut and place on the bottom of a large pot (which has a lid) or Dutch oven. All ready for the oven! Place lid on pot and bake in oven for 1 hour. Oh it be true! As a matter of fact I’m chowing down on some now for lunch. A roux huh? Hmm, I’m going to have to go back into the archives. Interesting twists here, and that’s the tough thing with the oral history of family recipes, there can be four different versions! I like the bacon addition. Roux -Yes; When I have a chance I will transfer the video to my computer and get you a digital copy. Don’t you wonder if sometimes they “forgot to mention” their little twists and that’s why ours never tasted the same as grandma’s? My grandma’s version (I never liked it when I was little so never tried hers- and my mom corrected me – she said grandma did add tomato sauce to hers too, but she cooked her’s in a pot on the stove…. This looks so delicious. I looooove stuffed cabbage though I’m used to the Jewish version which has a sweeter sauce with raisins (and obviously doesn’t use pork).